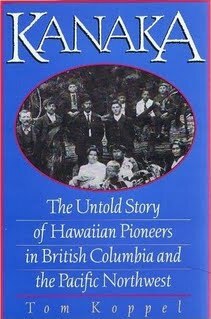 “NHGSoc has partnered with author and researcher Tom Koppel, to offer a great price on a copy of his book, “Kanaka: The Untold Story of Hawaiian Pioneers in British Columbia and the Pacific Northwest”. It is he ho’ohanohano nui (a great honor) to work with Mr. Koppel to offer our members not only a great price for the aforementioned book, but also to make known that he will sign and even inscribe the book with a personal message; of your liking, for all who make a purchase. This work is of very high quality, with extensive research done by Mr. Koppel into the individual lives of many Native Hawaiians in British Columbia and the Pacific Northwest. New copies of this same work of authorship, sell online for upwards of $40 or more and used copies sell for slightly less. For more information about this book and how to purchase it, contact the NHGSoc.